The May meeting of the Book Club will be on Wednesday, May 8, at 7:30 p.m. at the home of Garlan Braithwaite (14048 Brookridge Drive, Dallas, Texas). 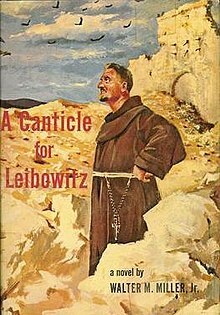 We will discuss A Canticle for Leibowitz, by Walter M. Miller, Jr. A Canticle for Leibowitz is a post-apocalyptic science fiction novel first published in 1959. Set in a Catholic monastery in the desert of the southwestern United States after a devastating nuclear war, the book spans thousands of years as civilization rebuilds itself. The monks of the Albertian Order of Leibowitz preserve the surviving remnants of man's scientific knowledge until the world is again ready for it. Watched over by an immortal wanderer, they witnessed humanity's rebirth from ashes, and saw reenacted the eternal drama of the struggle between light and darkness, life and death. For those who like to read ahead, the June book will be The Quiet American, by Graham Greene. Please note that the Book Club generally meets on the second Wednesday of each month. To RSVP for the May meeting, please e-mail Garlan Braithwaite at bti8484@sbcglobal.net. For more information about the Book Club please contact Lee Lowenstein at lee.loewenstein@gmail.com or Adrienne Dominguez at adrienne.dominguez@tklaw.com.